Hot Tags： H2 YACHT DESIGN LURSSEN. About 10 months after she launched, Al Lusail departed Lürssen for her maiden voyage. The curvaceous styling might be all we’ll ever see. Al Lusail flies the Qatari flag, and Middle Eastern owners keep details about interior design and accommodations under tight wraps. 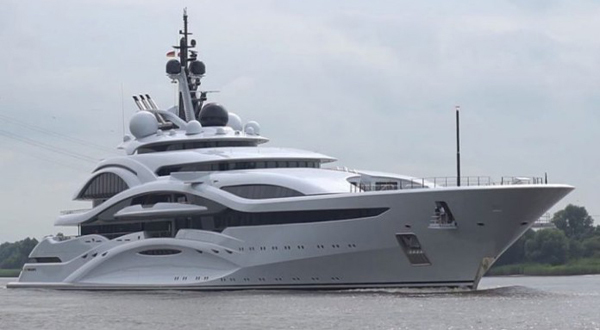 However, several months ago, Lürssen received permission to reveal limited information. For example, the yacht has a central atrium that welcomes sunlight to filter down to the base. The decor is modern, and eclectic. The company March & White translated the owner’s wishes, further applying “highly innovative” custom finishes, according to the yacht builder. Nautical touches appear throughout the megayacht, too. Altogether, inside and outside, Al Lusail “will stun the Hollywood crowd,” Lürssen says.